I like to think that the colors in latest piece on which I am working were inspired by early morning and late evening skies that I have been lucky to see in my travels. Maybe last year while I sat watching the snows of Mt Rainier glow gold and rose in the setting sun and its rocky outcrops cast deepening purple shadows, these colors made some kind of imprint in the creative corners of my mind. Sunset on Mt Rainier during the Braids 2016 conference in Tacoma. A Vermont sunset seen from Mt Philo during my visit a few years ago. Sunrise at the Florida Tropical Weavers Conference that I attended a couple of years ago. California sunsets around the Sierra foothills. And, most recently, while traveling after the ANWG 2017 conference, I watched Mt Hood starting to pull on its evening shroud of rose, purple and gold. So, I am working with purple, rose, copper, gold and blue. The linked diamond patterns have been fun to weave. I have enough room left on this warp to repeat the first pattern section and then I will figure out what to make of this piece of fabric for Marilyn. I can’t wait to wash and press it. 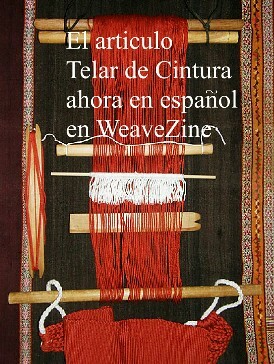 The fact that there is a lot of supplemental weft sitting between the layers of warp has made the cloth quite stiff. It is hard at this stage to imagine it having any kind of appealing hand. However, I am sure that it will soften and relax after the wet-finishing process. Purples, roses and golds….I had quite an extraordinary view of a sunrise on my recent flight to Australia. QANTAS airlines has a camera installed on the tail of the plane which transmits video to each passenger’s personal video screen. We took off from Los Angeles at around 11 pm and I waited many hours through the night for there to be enough daylight to enjoy the view from the tail camera just before we landed in the early hours of the morning two days later (we crossed the international date line along the way). Unfortunately, just when it gets really interesting and we start losing altitude to circle Sydney harbor and the city, we are required to put away the video screens. In any case, it was really amazing sitting there in the cabin and seeing the view from the tail as we sped along. And, I was able to experience yet another extraordinary view before leaving the USA when our backstrap weaving party in Oregon was visited by a friendly drone which took photos and video of us from way up high. Can you spot the ring of happy backstrap weavers down there? I love this shot because you can see the shadow of the drone in the upper right-hand corner. People have asked me to what we have attached our warps. It is a basket on a pole that is used for Frisbee golf. The days were long, gorgeous, hot and sunny and we didn’t last too long out there. We soon found ourselves back under the pop-ups where it was cooler and more comfortable. Weaving outdoors is always my dream but not so comfortable in Santa Cruz, Bolivia where I live…too hot and too many bugs to swat. Nine-year old Wendy, one of Maxima’s granddaughters, learns to weave figures on a band while Emily watches the herd. Photo from Dorinda Dutcher. The day-time weather in the central highlands, where my friends Dorinda, Maxima and the ladies of the Huancarani co-op live, is often described as ”eternal spring”. I think everyone sets up their leaning vertical looms outside in a covered area of their patio or they weave with warps hooked to their big toes while sitting outside on the grass as 9-year old Wendy is doing at left. Dorinda recently posted to her PAZA blog and I was excited to see a picture of Beatris using the demo loom at Dorinda’s place to weave some patterns from my book. I had left a copy of my book for the group when I visited last January. I taught Maxima to read the charts and promised to send another copy of the book just for herself which Dorinda was able to deliver recently. I was hoping that Maxima would teach some of the new patterns to other ladies that showed interest and it looks like she has been doing a great job. Maxima and I had woven together using patterns in my book on my visit earlier this year. I can see two patterns from my book on Beatris’s band in wonderful red, black and white. I am intrigued by her sword/beater as I have never seen one shaped like that. I can see that shape being very useful when one wants to beat with a rocking motion. I hope I get to meet Beatris on my next visit at the end of the year. It’s been a busy year for me travel-wise and I can hardly believe that almost a year will have passed when I next get to visit these ladies in the highlands. Halyna Shepko showed us this picture of the backstrap loom she set up under the pier on her family beach holiday. That’s quite a view she has. Doesn’t that look idyllic?! Meanwhile, my current view is one of the backyard at my brother’s home in Sydney where fourteen cheeky sulphur-crested cockatoos are perched on the roof and in the trees. They are beautiful but terribly destructive. As I sit here I hear the ”crack-crack” as they chew their way through branches and toss them to the ground below for no other reason, it seems, than to make their temporary perch more comfortable. It’s winter here in Australia and it is hard to get used to the early darkness after the long summer days in the Pacific northwest that I just experienced. Weaving conferences, fiber festivals and reenactment events are in full swing in the USA and I wanted to show you this picture of my weaving friend Tracy at an event called West/An Tir War. You might remember that I showed pictures of my backstrap buddies Janet and Tracy during a visit last spring. They had recently taken a sprang braiding class with Carol James and were busy putting their new skills to work. Here’s Tracy putting together one of several sprang frames made from bent willow branches for events at which she teaches. She is wearing a sprang coif on her head that was made by Carol James and a sprang pouch at her waist that she made herself. I find those pouches simply adorable! The bands on her dress are Estonian checkered bands. There is so much beautiful handwork here. This just takes my breath away. Katrin Kozevnikov MacLean designed and wove this on an inkle loom using a supplementary warp on the kind of ground weave used in Estonian and Baltic band weaving. She worked hard to design the leaves so that her warp floats did not span more than seven shots of weft and she has done a brilliant job. I would normally choose to weave something complex and irregular like this in double weave which does not have warp floats to consider. However, having warp-floats gives the leaves so much more texture and interest. And, the colors are spectacular together! She has opened my mind to many possibilities! Lynne, with whom I wove in Portland, sent me a picture of the pouch she finished after our gathering. 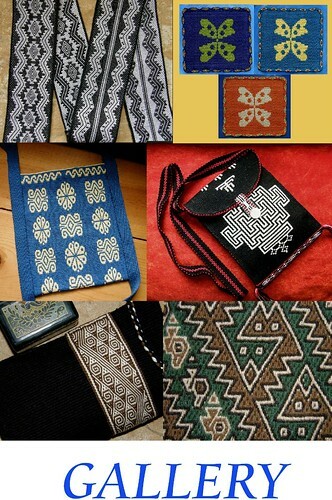 We used cloth woven by my Bolivian friends to make pouches and then applied various decorative finishes. I like how Lynne has added woven tubular bands in two colors which meet in the center in a tassel. 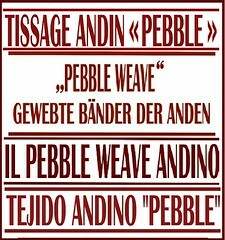 The motif she chose for her pebble weave strap closely resembles that used by the Bolivian weavers in their cloth. It is interesting how she has placed the hooks within blocks along the length of the strap. 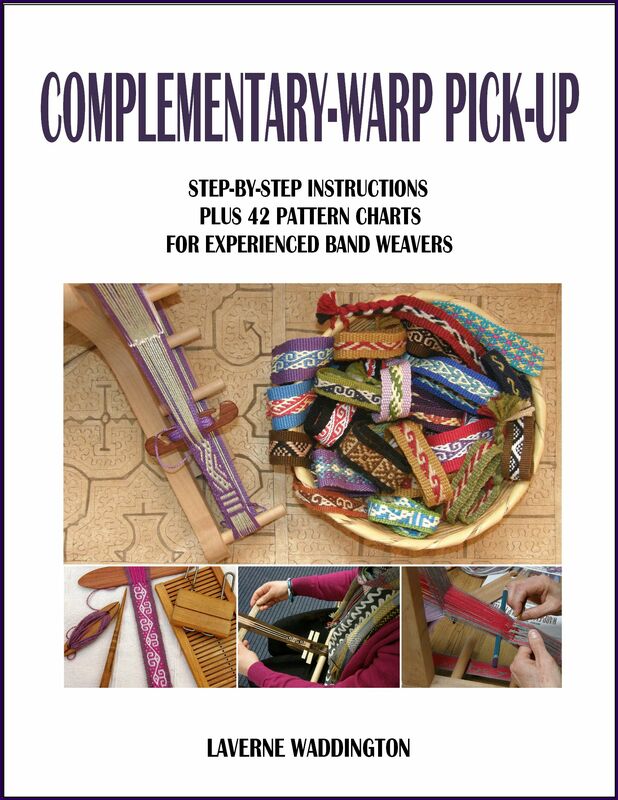 I wove with Mary in Alabama last spring and she has been finishing the samples we started together as well as creating her own warps to try new patterns. This band makes a lovely fob. Alison, who took my three-day workshop at ANWG, has set up to continue her backstrap weaving on her porch. Her backstrap is a red scarf. She tells me about the wildlife ”traffic” that accompanies her while she is weaving out there in that serene space…the sight and sound of a doe with twin fawns, a family of California quail, a rabbit and a trio of racoons. Imagine! Another Marilyn, this one in Alaska, has been studying my free Basic warping for Backstrap Looms video in which I show how to wind warps to create vertical or horizontal stripes. She has combined the two methods in this piece to experiment with various arrangements of stripes and bars and plans to make a few pouches with the fabric. Susan wove with me in two sessions at the ANWG conference and has gone home to finish her samples. I am so pleased to see this. 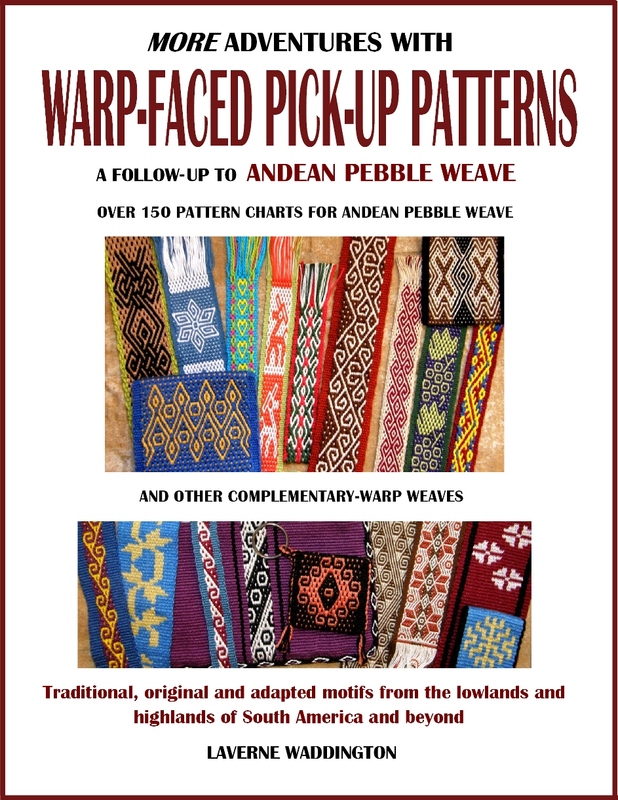 She has three lovely complementary-warp pick-up bands completed as well as a ñawi awapa tubular band. And speaking of marvelous things that have been happening since the ANWG workshops, you may remember that I showed you in my last post the bamboo reed that Tracy made in her workshop with Bryan Whitehead. She put in the hours to get her reed finished during her stay and I am excited to tell you that it is already dancing on cottolin warp and helping her create beautiful balanced cloth using her own hand spun cotton wool weft. Tracy describes the cottolin warp as having ”rustic calm”. I think this entire project exudes rustic calm. I can imagine the serene rhythm of creating plain-weave cloth with these clean and simple materials. Waist-deep in lush ferns surrounded by the dramatic rock walls that are so typical of this area. Further on at Maiyingu Marragu, which was a meeting place for Aboriginal tribes, we saw Aboriginal hand prints on the rock walls which are noted as dating from 500 to 1600 years ago. The hand prints are said to be stamps of ownership of the six clans that used the area…. I will leave you as I sit here looking out at the lengthening shadows in the back garden. It’s a serene view but the screeching cockatoos and squealing lorikeets certainly break the silence. Those are happy sounds. Maybe a kookaburra or two will start up in the distance as the sun sinks lower. I start my backstrap weaving travels along the coast of New South Wales on Friday. I hope to be able to pause and report along the way. So glad you’re in Australia enjoying the Blue Mountains! Great blog Laverne! I met your friend Tracy at BSG in Eureka last month. We shared a table at a Tablet Weaving class by Marilyn Romatka. Hi Laverne, welcome back to Aussie, hope you have a wonderful time at your brother’s. It’s a weird feeling you’re so close yet it almost feels further as I am so firmly stuck in life here. Are you visiting Melbourne while youre here? Anna, I am coming to Tassie to teach in Launceston and Hobart! I need to email you. I’ll have a day free (a Sunday) in Hobart. Beautiful photos & amazing weaving What a treat! Fabulous post Laverne! 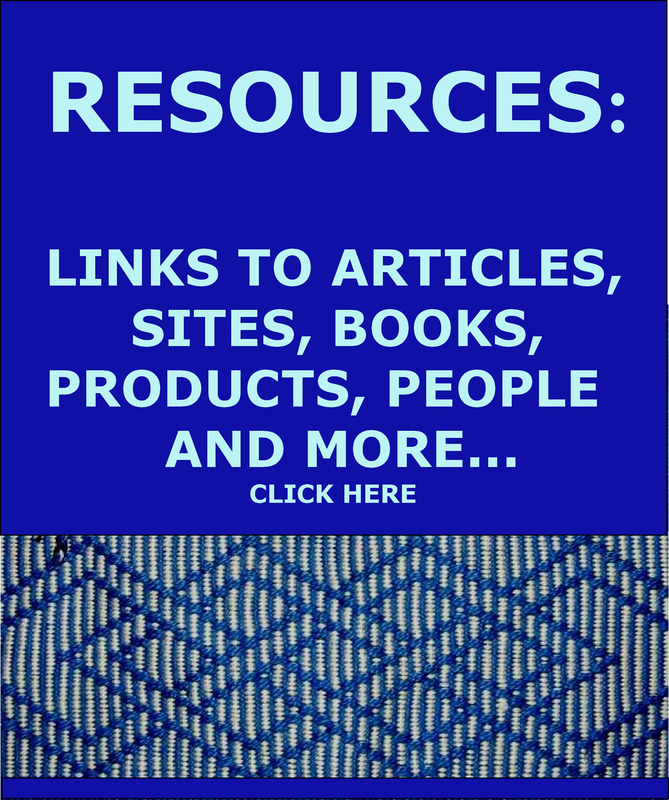 Congrats on two good articles Handwoven Sept/Oct 2017. So fun to see you there and know how your love of backstrap weaving is spreading.